Colour continuity doesn’t mean using the same color scheme in every room of your home. What it does entail is a smooth flow of color from one room to the next. 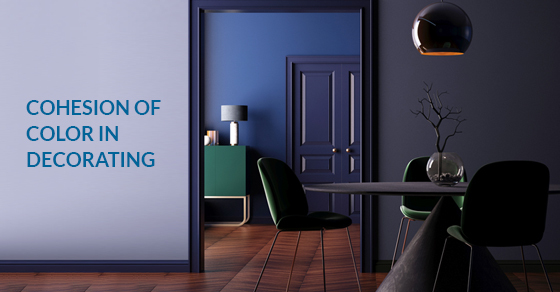 By choosing a color that connects your rooms, cohesiveness is simple to accomplish. If you’ve ever visited kitchen and bath showrooms, you’ve probably seen this type of decorating anchor. The colour you choose as the main color should be used in various shades in each room. For instance, you can use the colour as an accent in a living room/dining room space. That anchor colour can then be used in ways other than to colour the walls. If your main color is blue, consider an accent chair in shades of blue, or perhaps a throw rug or window coverings. Say your primary colour is buttercup yellow. Adding a bold accent colour will create visual movement in a room. Adding a fun shade will add interest to your decorating. If most walls are a soft yellow, perhaps one wall could be a rich burnt orange or ocean blue. If you go to home shows and visit kitchen and bathroom showrooms, you will see that most decorators choose to primarily use a calming, neutral colour. The intensity of the shade can vary from room to room. This is where introducing a fun color can make each area sparkle and will create visual appeal. An easy way to establish colour continuity is to choose something you really love in the room—like an accessory or a piece of furniture—and build on that. This could be anything from a piece of art you love, to an antique carpet, or a collection of pottery or old cups and saucers. The sky’s the limit. Use the colours in that piece to decorate the rest of your room. Bold “hit” colors like lime, turquoise and candy apple red paired with neutral tones would make any space sizzle! The bottom line when thinking about colour continuity in your home is that you should choose primary colors that you and your family love. It is your home, so it’s important that the spaces are reflective of your personality, and that you feel comfortable and relaxed in every area—from the bedroom to the laundry room.